Hasan Habib shoved for 264,000 on the very first hand of the day. Action folded to Paul Dlugozima in the hijack and he made the call. The race was on as Habib’s ladies were a slight favorite, until the flop came down Q J 10 , giving Dlugozima a Broadway straight. Habib was not out of it, however, as he had flopped a set. The turn was the J , giving Habib a full house and a lock on the hand. 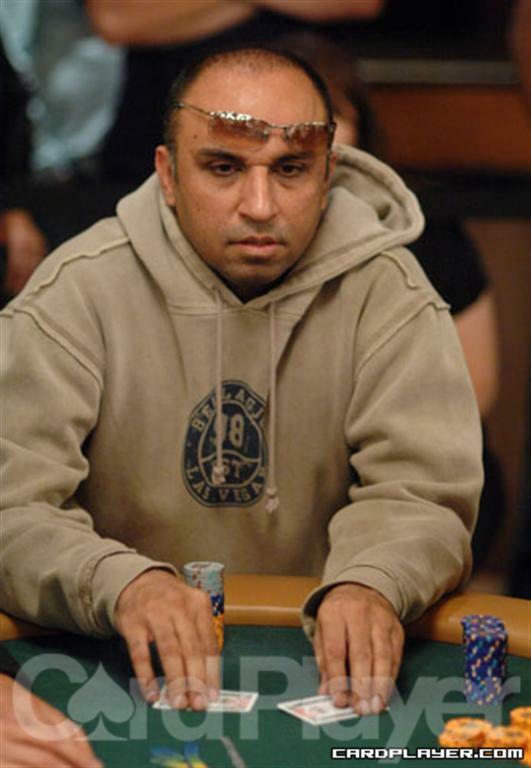 The river was the 3 and Habib doubled to 570,000. Dlugozima was left with just 64,000 and was eliminated a few hands later. Diogo Borges raised from the button and Ismail Erkenov repopped. The two went back and forth until Erkenov found himself all in for 684,000. Erkenov needed to fade a three outer and the flop fell J 7 5 . He was still ahead but still needed to fade an ace or running cards. The turn was the 9 and Borges was down to needing an ace to score the knockout. But the river was the 5 and Erkenov doubled to 1.4 million. Borges was hammered down to 160,000. Evan Lamprea raised to 38,000 preflop and Pavel Milanov made the call from a couple of seats over. The two players then saw a flop of 7 6 4 and Lamprea fired 52,000. Milanov made the call and the turn was the A . Lamprea fired another barrel, this one for 127,000. Milanov then decided to fire back, moving all in for 500,000. That caused Lamprea to muck his hand and he was down to 3.3 million. Milanov improved to 830,000. David Baker raised to 36,000 and Russell Rosenblum made it 110,000 to go from the button. Baker put in one last raise for just 8,000 more, putting Rosenblum all in. Baker held two live cards but both players caught a piece of the A 9 7 flop. Rosenblum stayed ahead when the board finished off J and 2 and he doubled to 275,000. Baker was at 717,000. Johnny Lodden raised from the cutoff and Richard Kirsch moved all in for 165,000. Lodden looked him up and they turned over their cards. 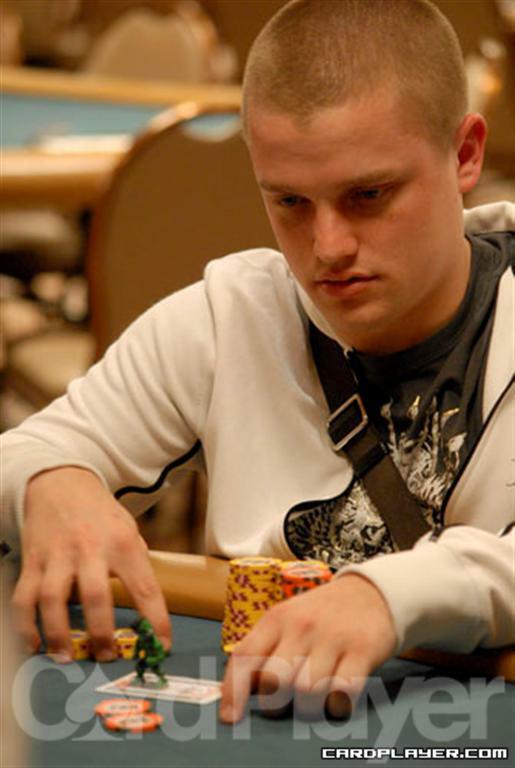 Lodden jumped ahead in the race when the flop fell A Q 4 . The turn was the 2 , giving Kirsch outs to a wheel. But the 10 bricked off and Lodden scored the knockout. He was at 2 million after the hand. Picking up the action after the flop, Jesper Hougaard moved all in for 205,000 after the flop came down K K 10 . David Peters looked him up with Q Q . But Hougaard had outflopped Peters as he tabled K J for trips. The turn was the 4 and the river was the 4 , filling up Hougaard and doubling him to 600,000. Peters was down to 580,000. Picking up the action after the turn, the board read J 8 3 2 . Johnny Chan fired 85,000 and Robin Bergren popped it to 205,000. Chan made the call and the river was the 9 . Chan kept his foot on the gas pedal as he led out with 250,000. Bergren had enough and threw his hand away. Chan took down the pot and he was at 2,850,000. A few hands later, Robert Pisano and Chan got into a raising war that saw Pisano all in for 2.19 million. Chan made the call and the ultimate cooler was shown. Chan was on the wrong end of the cold deck and the board ran out 10 5 4 7 4 . Pisano became the chip leader with 4.4 million while Chan was at 800,000. Villard was in bad shape against the overpair and for possible flush draws were covered. The board ran out A 10 4 10 J and Dorfman scored the knockout with jacks-full. He was at 1.45 million. We didn’t catch the action, but Matt Keikoan found himself all in after the board had run out A J 3 6 4 . Matthew Pearson decided to look him up and he turned over K Q for the second nut-flush. Keikoan could only show 7 4 for a lesser flush and he was shown the door. 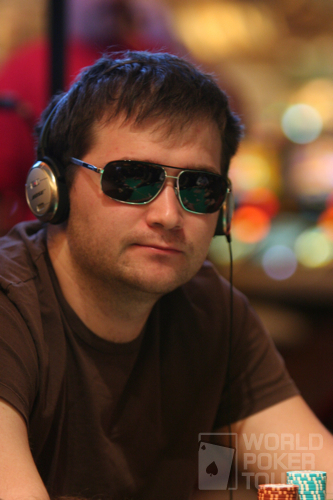 He took home $48,847 for his efforts in the Main Event and it was his third cash of the 2010 WSOP. He won a bracelet in Event No. 29 ($10,000 Limit Hold’em Championship). Pearson was up to 846,000 after the knockout. Jared Ingles opened for 35,000 and Daniel Chamberlain made it 85,000 to go from the hijack seat. Matt Affleck then made it 200,000 from the button and only Chamberlain stuck around. The flop then fell 8 6 3 . Chamberlain checked to Affleck, who fired 225,000. Chamberlain made the call and the 3 came on the turn. Chamberlain checked again and Affleck slowed down as he did the same. The river was the 7 and both players checked again. Chamberlain then tabled Q Q and Affleck mucked. Chamberlain was at 2.55 million after the hand while Affleck slipped to 2.45 million. Jean-Robert Bellande and Jesper Hougaard each saw a flop of A A 3 . Both players checked and the 7 fell on the turn. Bellande led for 65,000 and Hougaard made the call. The 6 came on the river and Bellande fired 125,000. Hougaard then moved in for 458,000 and Bellande took a tank session. He eventually mucked A K face up as he dropped to 700,000. Hougaard would move up to 1.02 million after he knocked out Claudio Baptista on the very next hand. The flop came 8 6 2 and nothing had changed. The turn came K , Sitron was one card away from a massive chip advantage at the table, but the river changed that. The river was the Q and Corwin Cole took down the pot, though you would never know it by his expression. He sat stone-faced, moving only to rake in the monster pot. After the hand, Cole had 950,000, Sitron had 250,000, and Jolly was eliminated... which nobody could deny. Daniel Hughes moved all-in for 145,000 from late position. Andrey Zaichenko moved all-in behind him and everybody else folded. Hughes showed A 10 and Zaichenko had Q Q . The flop came Q 8 2 and Hughes was drawing almost dead. The 10 sealed his fate and he was eliminated in 17th place. The flop helped out Biggar a lot: A 9 7 . The turn, though, was the 10 , giving Zaichenko an open-ended straight draw. The river was the blank of all blanks – the 2 – and Biggar doubled up to 250,000. Zaichenko still has about 900,000. Dan Heimiller raised to 40,000 in late position and action folded around to Andrew Garvin in the blinds. Garvin moved all-in for about 180,000. Heimiller insta-called and flipped up A A . Garvin showed 9 9 . The board came 10 7 5 8 K and Garvin was eliminated. Heimiller grew his stack to an even more impressive 1,100,000. Gary Biggar and Mimi Tran, both short-stacked, got all-in pre-flop. Biggar had Tran dominated with his A Q going against her K Q . The flop came 10 4 4 and the turn was the 6 . Going to the river, Tran had only 3 outs, and when the 4 peeled off, her tournament was over. After winning the hand Biggar was up to 175,000. Zaichenko did not make quads and he took a big hit, now at 750,000. Rouhani’s double up gives him 600,000. The board came 10 9 7 5 J and Sundberg won the hand with a jack-high straight. Sundberg now has 170,000 while Tran is languishing with 100,000. Matros has about 700,000. Fraulund is down to 160,000. The flop was perfect for Slaugbaugh: J 10 6 . Barchie could not catch up and he was eliminated. Two of the bigger stacks in the tournament, Matt Matros and Dan Heimiller, played a fairly large pot in the last level. Action folded around to Matros in the small blind and he raised it to 24,000. Dan Heimiller made a fairly quick call. The flop ran off 9 8 8 and Matros led out with a bet of 35,000. Heimiller made another quick call. Matros checked on the 10 turn and Heimiller bet 80,000. Matros stacked a column of orange chips, pulled them back in toward his stack, and declared himself all-in. Heimiller was now stuck. He stared at the board, talking to himself, for nearly 7 minutes before Matros called the clock on him. The floorwoman came over and informed Heimiller that he had one minute to make a decision and at the end of the one minute his hand would be ruled dead. No sooner than she had finished her speech, Heimiller folded his hand. After this confrontation, Matros is up to 520,000. Heimiller would be down to 455,000 but later chipped up to 610,000 to become chip leader. 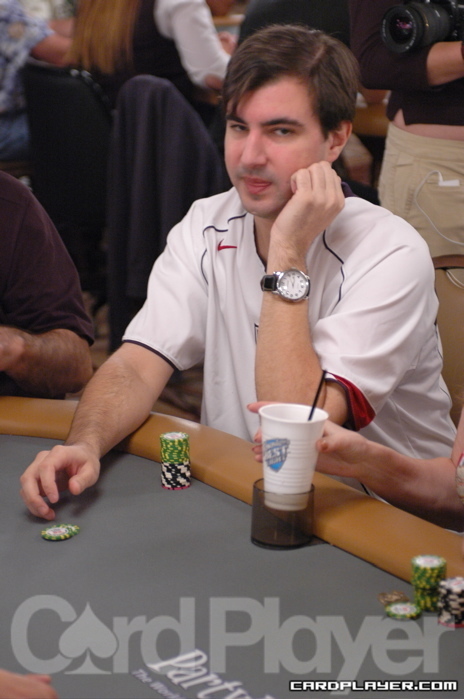 Alvin Zeidenfeld, action having folded to him, moved all-in from the button for 63,500. Mimi Tran folded and Martin Cardno made a quick call. Zeidenfeld showed Q J and Cardno had A 8 . The board – K 7 7 9 3 – changed nothing, and Cardno won the hand. After a few moments of counting by the dealer (with some help by Mimi Tran), it was decided that Cardno had more chips and Zeidenfeld was eliminated. Cardno now has 140,000. Gary Marcum moved all-in from middle position for 70,000 and Andrew Garvin made a quick call after action folded around to him. Marcum, without much confidence, showed A 8 . His pessimism was warranted, however, as Garvin showed A A . There would be no miracle for Marcum as the board rolled out Q 5 4 9 A . Marcum was covered by a few thousand, and he was eliminated. After the hand Garvin was up to 140,000. Kirsch, who was beating Tom handily early, saw the momentum swing the opposite way and never could recover. After he bet and was raised, he finally got his money all in on a board of J 8 2 , about 45,000 more. Tom sat there for about five minutes, before calling a clock--on Kirsch! "I've been all in for twenty five minutes," replied Kirsch. Tom sheepishly called, showing J 9 . Kirsch was drawing open ended to a straight with 10 9 , and made a pair on the turn with the 10 but missed on the river. Tom will advance to tomorrow's final table. After battling seemingly all day as the short stack, Katchalov's tournament life finally rode on a simple flip of the coin: 7 7 against Tom Roupe's A Q . The flop of A 10 10 spelled doom for Katchalov, who found no miracles on the turn or river. Roupe went into heads up play with John Murphy with about a 7 to 1 advantage. Beebe and Jamshedi have been trading pots all day, so it's fitting that the two are battling heads up for the opportunity to play in tomorrow's final table. Beebe held a significant advantage in chips when he raised Jamshedi's blind to 18,000, and Jamshedi made the call. After Jamshedi checked a flop of K 5 3 , Beebe announced all in. Jamshedi immediately called. Beebe showed A A , while Jamshedi had flopped big with the K 8 , but still needed help to stay alive in the tournament. The 6 came off on the turn, changing nothing: Jamshedi still needed a king, eight or heart to win a pot worth about 340,000. When the 6 spiked on the river, the usually mild-mannered Jamshedi let out a yelp of exultation before composing himself. He now holds a slight advantage over Beebe. Mark Ketteringham gets it all in with A K against Richand Kirsch's 7 7 . The comes with two spades, then Ketteringham picks up a gutshot on the turn. But the river is a brick, Ketteringham fails to improve and is sent home in 19th with $17,292. It is folded to David Peat in late position and he raises to $70,000. Richard Kirsch moves all in for $328,000 more. Peat goes into the tank, yells for cocktails, then makes the call with A 5 . Kirsch tables A K and the board comes A 7 3 3 J . Kirsch takes the pot, leaving Peat with just $10,000. On the next hand Darrell Dicken calls, Peat moves all in for his last $7,000 in the dark, Kirsch calls, Jon Little completes from the small blind and Cory Carroll checks from the big blind. The flop comes T 4 3 and it is checked around. The turn is the 7 , Little bets $40,000 and Dicken is the only caller. The river is the 6 , and both players check. Little shows 10 3 and Dicken mucks. Peat finally turns over A 7 which isn't good enough to beat Little. Peat is eliminated in 7th places for $72,047. Phil Ivey raises to $60,000 and Richard Kirsch calls. Jon Little pushes for $301,000, Ivey folds and Kirsch makes the call with A Q . Little tables 9 9 , the board comes K 6 3 2 J and Little doubles up to over $800,000. Amnon Filippi bets $31,000 from late position and Richard Kirsch announces raise on the button. He fires out $100,000 and Jonathan Little then moves all in right behind him from the small blind. Amnon folds and Kirsch goes into the tank. He says "I just can't call here," and tosses two jacks face up on the table. Little has been very fond of moving all in over the last couple of hands and has been able to pick up a lot of chips with his aggression..
Phil Ivey raises to $36,000 and both Darrell Dicken and Richard Kirsch call. The flop comes 9 2 2 , Kirsch leads $36,000, Ivey calls and Dicken folds. The turn is the K , Kirsch checks and Ivey bets $80,000. Kirsch quickly calls and the river brings the Q . Kirsch checks, Ivey ponders then checks behind. Kirsch tables 10 9 and Ivey mucks his hand. Kirsch now has $890,000 in chips. Richard Kirsch makes it $50,000 to go and John D'Agostino raises all in for $90,000 more. Kirsch makes the call and shows 8 8 . D'Agostino turns over A K . The board comes 6 2 2 J 8 and D'Agostino is eliminated in 14th place.